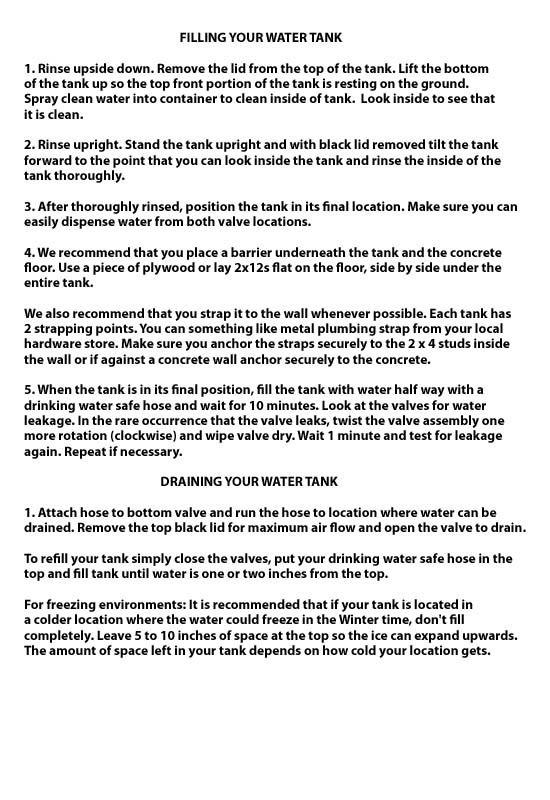 The in water storage technology. This tough high-capacity tank was designed for convenience and usability in emergency situations. This tower hold 525 gallons water supply shielding you from dehydration during natural disasters as well as providing hygiene needs. Containers are made from 100% non-toxic food-grade HDPE and are completely BPA free. Brass fittings are highest quality available and partly recessed to minimize exposure. The water tank's footprint takes up the small space at 45 inches wide, 45 inches deep and 82 inches tall. Comes with recessed strap groves allowing for the tank to be strapped to a wall so it is extremely difficult to tip over. Straps (not included) can be purchased at home improvement type stores. Lower valve allows for easy drainage and fill-ups (water rotating) and the upper valve makes filling portable water containers a breeze. Lastly, the cap is spring loaded to prevent air lock when releasing water through the valves. The ultimate in water storage technology! When it comes to extreme situations, water is THE most important element for survival. Your body loses on average 2.5 liters (or 2/3 of a gallon) of water every day, but can handle only a loss of about 10-22% (which happens after about 3 days of no water) of its water weight before it becomes fatal. Secure your family's health by obtaining a fresh water supply now to prepare for emergencies like earthquakes, violent storms, or contaminated public water supplies with this high-capacity water tank. Many water storage barrels on the market are awkward to stack and too wide for storing an adequate amount of water. This container holds almost as much as ten 55-gallon barrels, but takes up the floor space of two! Don't forget to add Water Preserver to extend the life of your emergency water and reduce the frequency of water rotating! NOTE: Click here for installation instructions. Also check out the videos to the left for more installation tips and information.